So says guitarist Bryan Cohen, who co-founded the band in 2011 with bassist Paul Christofferson, later adding guitarist, keyboardist and saxophonist Trevor Rasmusson and drummer Zia Uddin. Howell’s vocals on the anthemic song “Calling the World” carry the song’s choruses into the stratosphere. “Sometimes on stage, I feel like I’m in an intergalactic Led Zeppelin launching into hyperdrive,” Cohen added. The five-member group performs one of its biggest shows to date Saturday, Feb. 22, at High Dive, with Breaks & Swells and Kissing Potion sharing the bill. The show will feature songs from the group’s new seven-song EP, “Raheem Rising,” a collaboration with Seattle producer Martin Feveyear. Get all the details about the High Dive show here. Radio Raheem was named for a character in the 1989 comedy-drama “Do the Right Thing” about racial tension in a Brooklyn neighborhood. It was written, directed and produced by Spike Lee, who portrays “Mookie” in the film. Radio Raheem is a tall, young black man who loves to blast Public Enemy’s “Fight the Power” on his boom box wherever he goes. 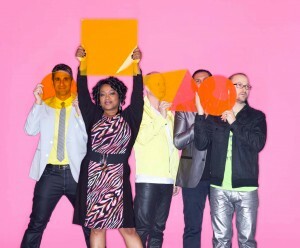 The band has been compared to Grace Jones, Tina Turner, Fitz and the Tantrums, even the Talking Heads. In the video for “Calling the World,” the band plays the song in a ship made of tin cans, battling a dastardly, music-hating villain. “That’s Radio Raheem for you — reaching for the stars and ending up with a big old dance party!” Cohen said. Learn more about the band by visiting its official website here.